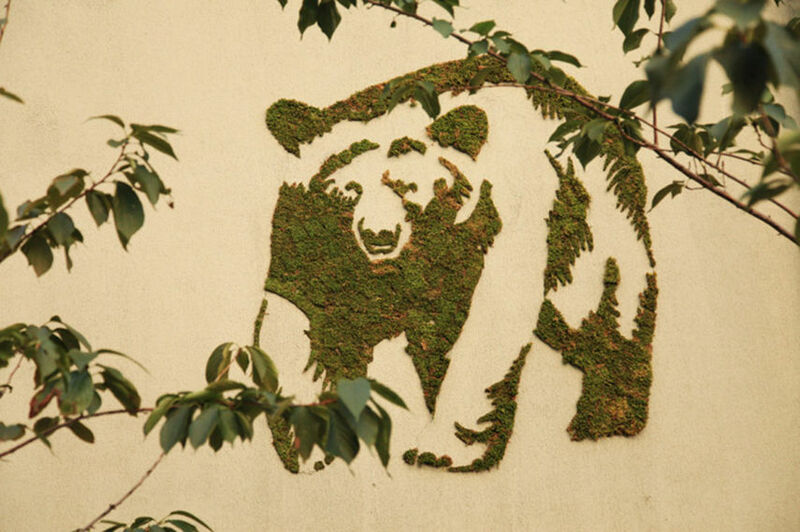 How to Make Moss Graffiti - Step by Step Guide to the Coolest DIY Project or Something Else? 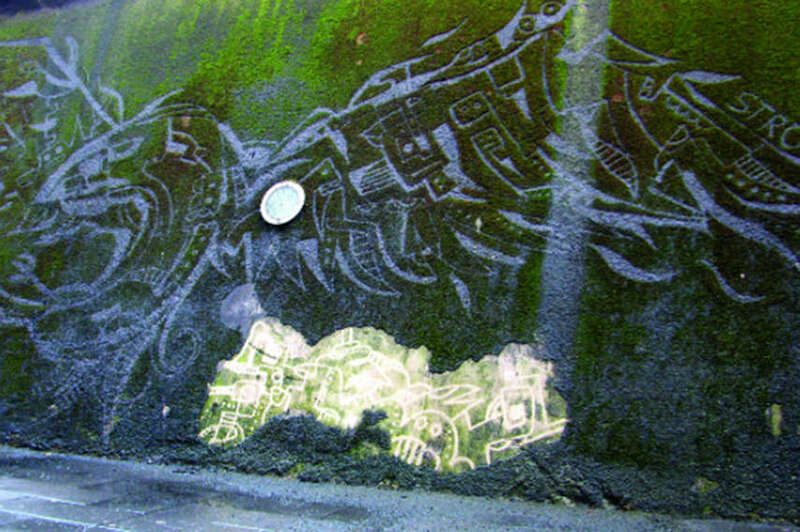 As part of our DIY summer special, we decided to bring the culture of moss graffiti closer to our readers. This recent street art form has gathered so many admirers around the world that we simply cannot put its relevance into question. 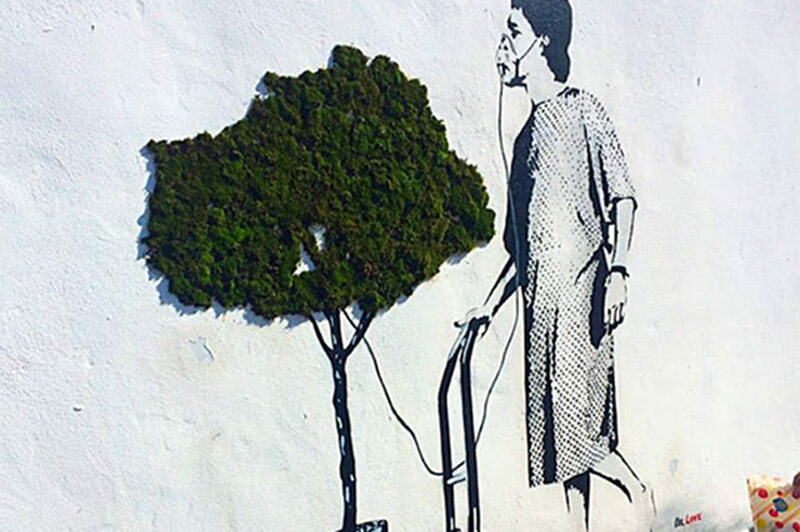 Eco-graffiti or environment-friendly street art is the young offspring of guerrilla gardening which tends to bring nature into our urban public spaces. It seems that for some artists the traditional spray paint and marker pens became too toxic and mainstream, so they decided to take more “natural” approach to their creative endeavors. We recently wrote about essential steps in making your first stencils and mural paintings and today we are giving you some suggestions on how to make moss graffiti in our in-depth, step-by-step tutorial. 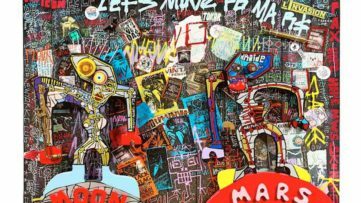 Unlike other forms of street art that can be finished in a day or two, if we consider large-scale murals, this project will require much more patience and effort cause that moss isn’t really going to grow on its own, at least not in the beginning. Otherwise, it is really so simple that even your granny can do it. And why not? She might even want to join you some day. Wouldn’t that be a great thing to see? Anyway, let’s get our hands dirty and start our mossy tutorial. 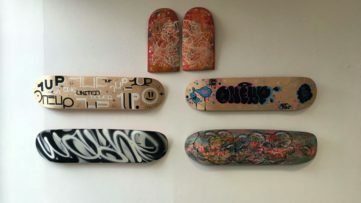 Let’s first take a look at some essential tools that you must have if you plan to make your graffiti garden. You will need moss, of course, and we’ll talk about the right place to find it later. Then you must have blender or a similar gadget that will never be used for its original purpose again, a couple of cups of water, the same amount of buttermilk or yogurt (vegan yogurt will serve), a tablespoon of sugar and corn syrup (optional). And if you are really, really lazy some innovative people even made a special moss milkshake which comes in a regular milk carton but already has all ingredients mixed for you. If you plan to do it from scratch, then stay on this page for a while longer. What is the best moss that can serve your purpose? You need moss that has been on the streets before and not some previous “tree hugger”. So forget your trip to nature and start ripping the moss from the cracks in the pavement. It’s the moss you need because you know it will thrive in the urban environment. And if there isn’t any moss in your area then the climate is wrong, and you can forget about it all, and accept the fact that you will never become a star of the moss graffiti scene. Once you have one or two handfuls of moss ripped from the ground with the roots, and cleaned from the dirt, you can begin to mix the ingredients. This is where you want to get that blender working and the recipe is as follows, with no special order required. You want to break large pieces of moss into smaller ones and place them in the blender. Then you add 2 cups of buttermilk or alternatives which are discussed earlier, 2 cups of water, a tablespoon of sugar and that corn syrup for a smoothie-like texture. Once you have your “paint” it is time to choose the right location, pick up your brush and paint your mossy masterpiece. 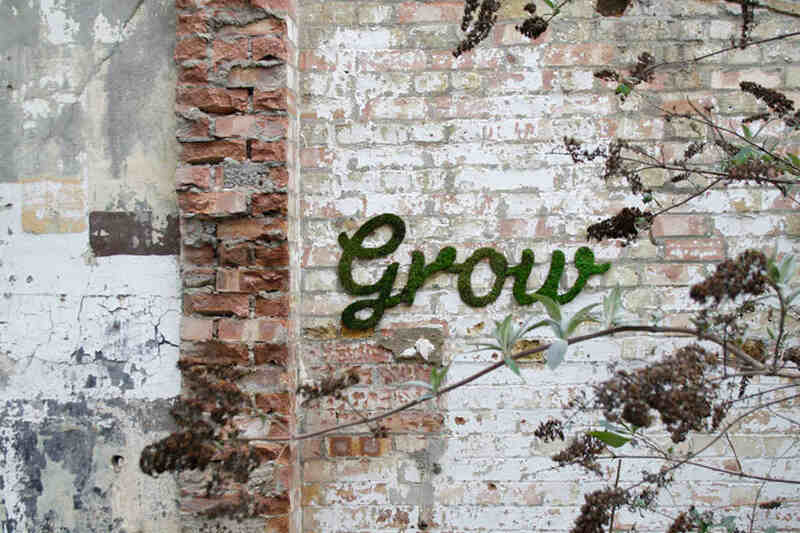 Anna Garforth – Grow, 2013. But what is the best wall? 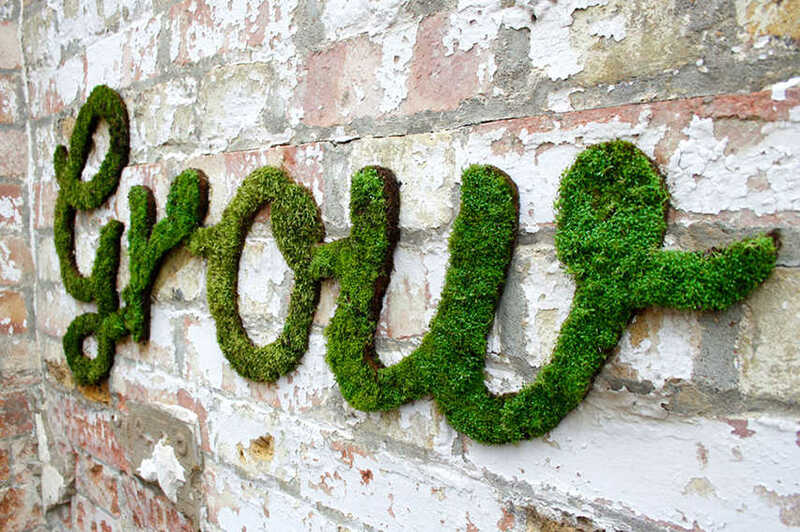 Why should you go through all this trouble if your moss graffiti won’t grow? Well, this is where some essential botanic knowledge comes to the rescue. First of all you should consider planting your artwork in spring or autumn, as moss likes moist and will thrive on those places not exposed to direct sunlight. Secondly, the best place is a stony area or a wall made of bricks. And definitely do not forget to plant your artwork high above the ground or otherwise your moss graffiti will become a feast for slugs. Once you know all this you are ready to get your brush and spread your mixture on the wall in the shape of your previous design. You also shouldn’t forget to sprinkle some water on your artwork occasionally and see how it grows day by day. 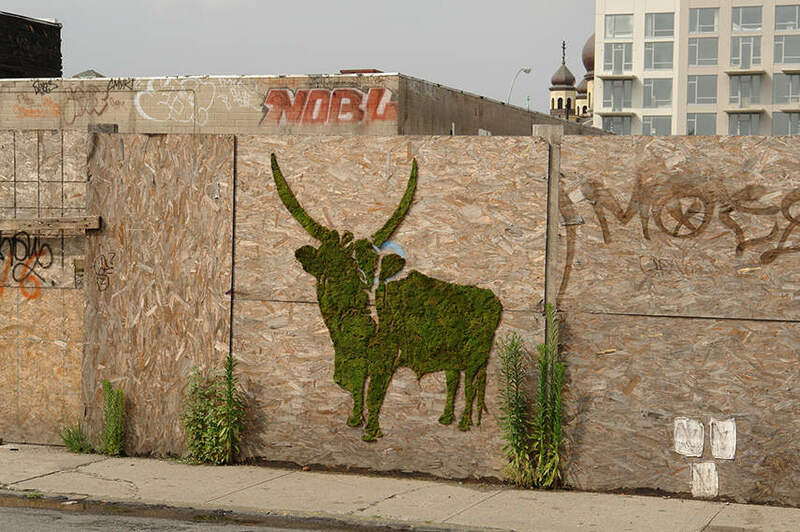 And that is how you make moss graffiti, the coolest DIY project, loved by the local community members worldwide. But is it really loved by all? Create your My Widewalls profile for FREE and checkout more DIY projects this summer!